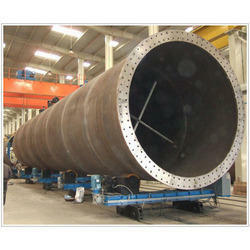 We are the leading manufacturer, importer and exporter of Turning Rolls. With rich industry experience and knowledge, we are manufacturing, importing, exporting, trading and supplying a qualitative variety of Turning Rolls. The offered turning rolls are designed using high quality material & sophisticated technology. These turning rolls are used for rolling and positioning for applications. In addition, our turning rolls are tested on numerous parameters of quality for ensuring its faultlessness. Customers can avail these turning rolls from us at reasonable rates. Looking for Turning Rolls for Tubes and Pipes ?